Why don’t the Oscars have alcohol? Let’s booze up the Oscars. Give this woman a cocktail. It will liven up the Oscars. Photograph by Kevork Djansezian/Getty Images. Photo illustration by Jenny Livengood. If awards shows were work appointments, the Golden Globes would be an office cocktail party and the Oscars would be an overwrought PowerPoint presentation. The obvious reason for the discrepancy in tone between the two film industry mega-events is that the Golden Globes actually are a cocktail party: The Hollywood Foreign Press Association graciously serves its honorees food and plenty of drink during its ceremony, so the audience occasionally hears a slurred remark by a presenter or an off-color acceptance speech. 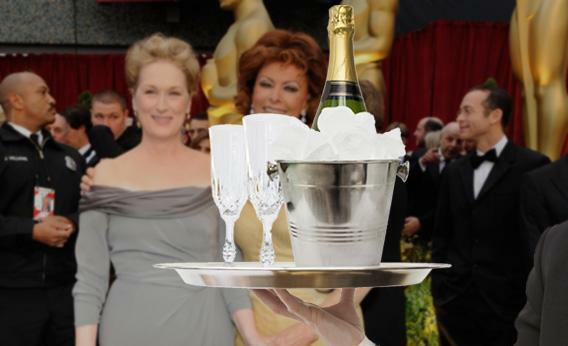 If the academy wants to lighten up the deadly solemnity that bogs down the Oscars every year, why not follow the Globes’ lead and serve alcohol during the ceremony? Give some unsung bartenders a moment in the spotlight by asking them to invent a new Official Oscar Cocktail each year, and serve it to everyone as they take their seats in the Kodak Theatre. (Release the recipe online in advance of the awards, too—the buzz, in both senses of the word, will be terrific.) Allow the nominees free rein to visit an open bar during commercial breaks and endless montages; God knows they could probably use something to ease their nerves. And hand a glass of champagne to winners as they take to the stage to accept their little gold men. It’s the highlight of your career—why not celebrate, for crying out loud? The poor Oscar attendees—most of whom care about only one or maybe two of the award categories—will rest a little less stiffly in their seats for the three-hour-plus duration of the ceremony. The presenters will sound less as though they’re reciting the Pledge of Allegiance and more as though they’re actual human beings, with feelings and interests and everything. Best of all, viewers will watch knowing that any of the beautiful people onstage could slip, sob, swear, utter an impolite truth, confess an indiscretion, or foolishly dial an ex—all the things we little people do after a few drinks. Anyway, it seems only fair to allow the actors, directors, and producers to drink during the ceremony. After all, we’ll certainly be drinking at home.